Artist Statement: This series of photographs explore the change of social and gender norms and celebrates the freedom of self-expression. 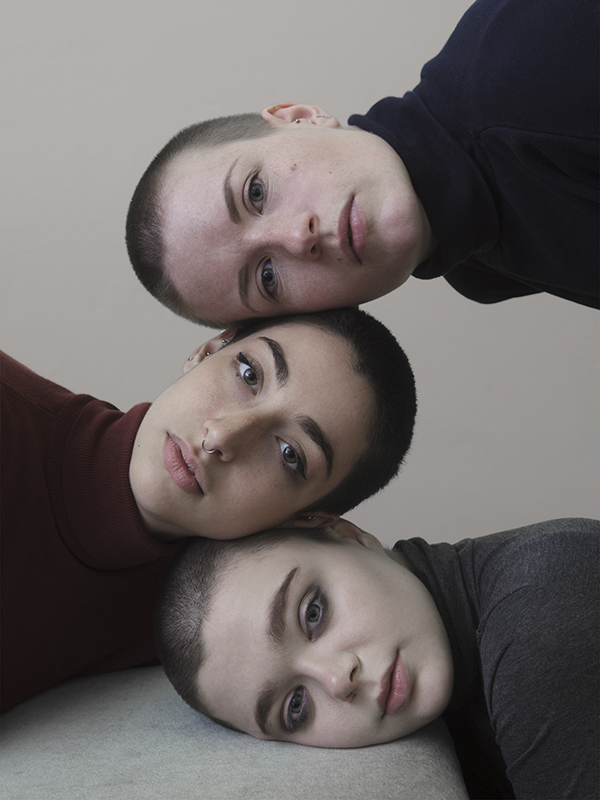 Portraits of young women with shaved heads depict the acceptance of this change. Marina looks back to historical meanings, illustrating the present rejection of this body feature as a symbol of disgrace, masculinity and unfavourable physical feature. What and where did you study? What's your favourite thing about photography? I studied Photography BA (Hons), at Edinburgh Napier University. My favourite thing about photography....probably playing with captured reality. In a second, you can turn a real object or a person into something unreal, confusing or even disturbing, just by shifting the angle, you can show it all or you do not show anything and leave the viewer to speculate. Also, different types of printing. Even though this project was shot digital, I still prefer shooting on film, developing it and printing the photographs myself. As you've been awarded the graduate prize from Millennium Images Peaches and Cream competition, can you share any advice to new graduates? I am new too, so maybe the one I gave myself... keep shooting, explore different art and media forms and be patient? Who are the women in your images? Do you think it's important for us to know your relationship with your sitters? The women in my images are local Edinburgh girls. It's interesting, I have had a very few sitters that I had not become closer with during and after the shoot. It depends on a sitter. You can sometimes actually see this process on contact sheets afterwards. Tell us about the video that accompanies your series. What encouraged you to explore your ideas through moving image as well as photographs? The extra short film is an experimental piece where I placed the interplay of interior, exterior, light and shadow into the context of gender and social norms- in shape of a metaphor. I was always interested in moving image as much as photography but I have just started REALLY experimenting with it (I have some raw, confusing footage, filmed when I was 14). As someone who spent a number of years capturing things through image only, I found working with sound and movement to interpret things challenging. Was it easy for you to make this work? Could it been seen as a form of self-reflection and exploration into personal interests? To be honest, the beginning is always difficult but it was easier than I thought it will be. I knew what I want, I had some sketches to lead me but there is usually a surprise moment that can ruin some part of the idea when shooting and the moment that can turn it into something wonderful you did not expect. I think it was more like a subjective interpretation of this "evolution" of gender and social norms. How will winning Peaches and Cream benefit your career? What are you hoping to achieve? I think the prize will help my work get noticed, push me forward to achieve more, while I do what I love. Also, it will definitely help me get more contacts and meet artists I could collaborate with.